Filco Carting Corp has sent notices to our customers of the new NYC Commercial Recycling Laws. Summons will be issued for non-compliance. Filco Carting operates its own materials recovery facility where we were hoping that we would be able to continue servicing your business with only one truck, commingling clear and black bags into the same truck, which would be sorted at our facility. This is a critical factor that enables us to maintain our current pricing structure. Putting a 2nd truck on the road to service the same building is extremely costly. Unfortunately, the City of new York has confirmed that we will no longer be able to Commingle Clear and Black bags into the same truck when enforcement of the new laws take effect. CLEAR and BLACK TRASH BAGS CANNOT BE COMMINGLED INTO THE SAME TRUCK. What does this mean for the way that you manage your waste program at your property? 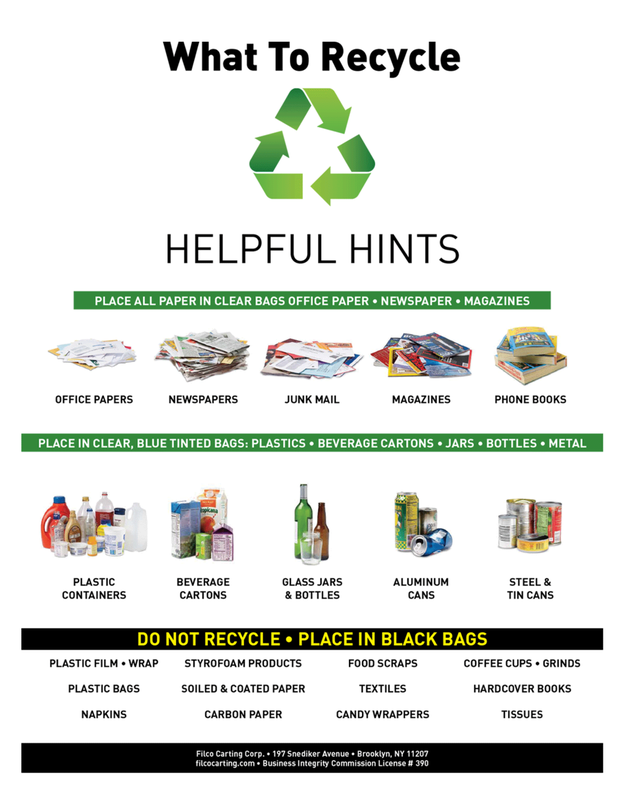 All materials listed on this handout are considered RECYCLABLE and MUST BE PLACED INTO CLEAR TRASH BAGS (except Cardboard boxes, which MUST BE FLATTENED & BUNDLED). Waste materials that are not listed on the handout are considered NON-RECYCLABLE, and those items MUST BE PLACED INTO BLACK TRASH BAGS. The end results of this New Law is that we will probably have to start dispatching 2 trucks to every building we service; one to collect Clear, Recyclable Bags and the 2nd truck for Non-Recyclable Black Bags. Depending on the volume of Black Bags generated at your building, this MAY HAVE AN IMPACT ON YOU SERVICE RATE. But we will not know for sure until the process in underway. Filco Carting will be surveying your building and we urge you to begin the tradition to Clear Bags for the Recyclables Only for each building tenant, because effective April 1st, 2017 WE WILL NO LONGER BE TAKING ANY BLACK TRASH BAGS INTO OUR RECYCLING TRUCK. Please contact your Building Manager with any questions on these new Recycling requirements. Develop a plan for how waste will be collected and set out fro your building. If your building management handles waste, work with them to be sure your business complies with their plan and the City’s recycling rules. Single-Stream Recycling is a system in which all recyclables, including newspaper, cardboard, plastic, aluminum, junk mail, etc.,are placed in a single CONTAINER for recycling. We value our relationships and customer service is a top priority. If you have questions, or to find out more feel free to contact us. To contact us, please fill out the form.